Conitec NETPORT modules are a series of intelligent I/O modules with Ethernet and USB interface. They can be used for PC port extensions, as well as for distributed control jobs on the network - such as acquiring data, monitoring processes, or operating relays, solenoids, motors or lamps. All NETPORT modules have stand alone capability. They run scripts that can be uploaded by LAN or USB port. This way, I/O control or data aquisition tasks can be performed on the network without the need of a PC. No additional software is required to set up a NETPORT module connected through a local network - any browser will do. A NETPORT module contains a HTTP server. When the module is connected to the LAN or to a USB-Port, it can be configured through a web interface, just like a router. 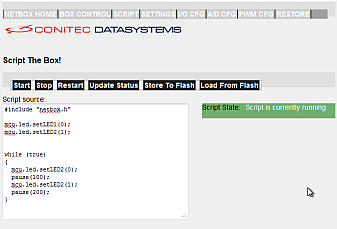 On the web interface, all I/O ports can be controlled or simple control scripts in C can be entered. For integrating NETPORT control in other LAN based applications, the web interface can be fully customized or replaced by a user supported web page. 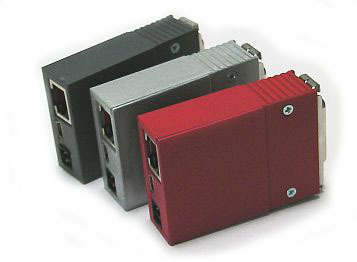 NETPORT modules can be remote controlled through a simple socket interface, a MAD bridge, or batch files. Rapid software development toolkits or authoring systems can directly control NETPORT modules through their script language. Alternatively, a driver DLL is available for easily implementing NETPORT modules in own software. The optional System Customizing Kit allows users to modify NETPORT's Linux based operating system for special purposes. The kit contains the adapted Linux Kernel, the root file system, the adapted BusyBox with services such as telnet and ftp, the configuration / autostart scripts with network setup, the boot loader and flash software, and optional access to an individual MAC address pool and USB ProductID. Also included is a library for low level control of all peripherals, a source collection of all free sources used, and 6 months technical support by email. Price plus VAT and shipping. Warranty: 24 Months. Certifications: CE, RoHS.